Join the discussion on our forums! Come discuss Farraki Battleaxe over in our dedicated Farraki Battleaxe discussion topic. 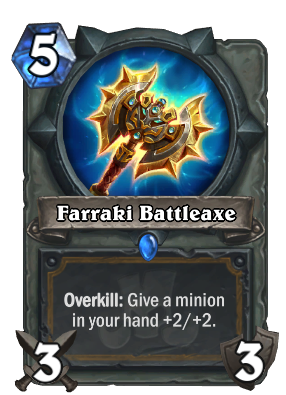 Overkill: Give a minion in your hand +2/+2. Only two things in life are certain: death and axes. Deathstalker Rexxar's battlecry procs overkill. Seen all the comment below, get the downside of this card, but Shrink Ray does provide and overkill of +2/+2's on the other hand. I might try that out for a boardclear to see which fun things i can come up with. A few expansions too late... Handbuff never really worked then, probably won't work now. Sorry. Fixed version of Brass Knuckles – buffing it. to give +2/+2 makes it WAY better. expensive, and the randomness make it mediocre at it's best. if it would cost 4 mana, is another story. It' seems that all paladin card are expensive this expansion, I don't know how that is going to compete against even/odd paladin honestly (they released a couple of "tech" anti-token cards, but still, life finds a way (jurassic park quote)), or make it even viable. Paladin control looks so slow. Well I hope we are just underestimating this but as for now, it looks pretty weak. Battlecry or deathrattle would make it much better. It does combo with all effects that paladin uses to manipulate health - Equality or Shrink Ray but having to play clear spell (that we already play!) and use it to get +2/2 instead of developping board presence or clearing whole board with the mentioned spells... I do not see it as very good. Hope to be wrong. Playable, but Overkill kills this card. In some situations, it could be just 9-damage over 3 turns for (5), which is really bad. Maybe will find it’s place in Heal Paladin, buffing Lynessa Sunsorrow or Mechano-Egg.